Our idyllic garden-cafeteria is situated directly on lake Forggensee's hiking- and cycling path and offers spectacular views of the lake with its boats, the nearby castles and the amazing mountain range. 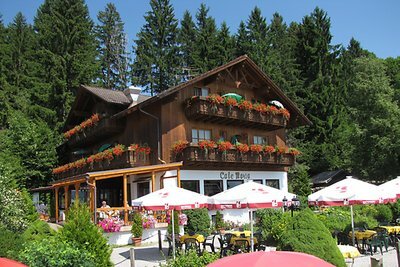 The ideal stop for your hiking and cycling tour at lake Forggensee, Café Maria offers coffee and cake, traditional Bavarian cold platters and tasty choices from our diverse menu. You also have a choice between homemade apple fritters, almond waffles, cream puffs, strudel specialities as well as a large choice of homemade cakes. Come visit us - we're looking forward to welcoming you!